Take your makeup up a notch with Colorescience’s HD powder. Light, breathable, and smooth to the touch, you won’t even notice you’re wearing it. Our powders come with an attached, self-dispensing brush to take the mess out of application. Better yet, they contain SPF to protect your face while delivering the coverage you crave. What is an HD powder? A HD (high definition) powder is a setting powder that preps, primes, and perfects the skin to ensure every detail of your face is photo-shoot ready. Moreover, HD powders even out your skin tone and increase the wear of your mineral face makeup throughout the day. How do I apply HD powder? The first step in application is choosing your shade of natural face powder. Select between fair, medium, tan, or deep. Next, sweep the brush over your face to release the mineral makeup face powder. Use small, circular strokes to release more powder for more coverage. 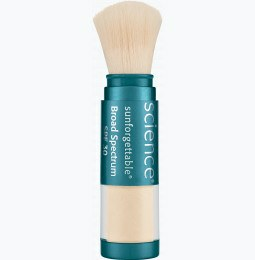 Our Sunforgettable Brush-on HD powders offer powerful UVA/UVB protection while setting your makeup, so don’t worry about applying sunscreen afterwards. Be sure to apply liberally before sun exposure, and to reapply every two hours when you’re swimming or sweating. By combining a finishing powder with SPF, we make on-the-go application effortless. 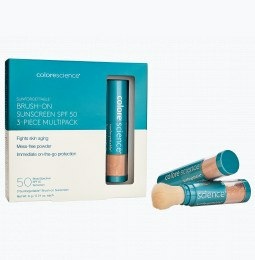 Does Colorescience sell other powders? Yes, we do. 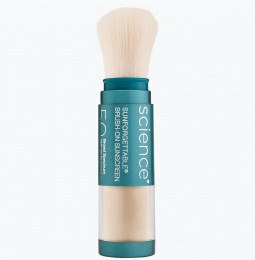 We also offer a loose mineral foundation with SPF 20 for hassle-free foundation application. If you enjoy pressed powders, our Natural Finish Pressed Foundation is both lightweight and hydrating. You can find a safe face mineral powder by Colorescience for any skin type. Use our dry skin mineral face powder to help treat irritated, flaky skin. Our unique formula will cover any imperfections and nourish your skin naturally to give you a hydrated, fresh-face feel all day. If your skin suffers from excessive shine, use an oil control face powder to restore your glowing complexion. What if I prefer liquids or creams? We offer whipped and liquid foundations alongside our powdered options. These are great options for those who seek heavier coverage. Keep in mind that HD powders are great for setting any makeup application – liquid or otherwise.